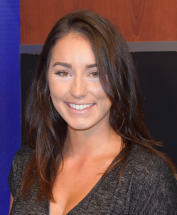 Samantha Kindler is a senior studying Multimedia Journalism at UNF. First Coast area fans of the hit HBO show Game of Thrones have an opportunity to meet several of the HBO hit show's cast members in Jacksonville this weekend. Hundreds headed to Jacksonville’s Willowbranch Park in Riverside Friday afternoon in hopes of finding up to $2,000 hidden around the park. With the first phase of the 30-mile Emerald Trail around downtown Jacksonville on track to be built by 2020, the nonprofit Groundwork Jacksonville is looking to hire a trail project manager. A former Jacksonville teacher is stepping up to help students experiencing hardships. The 1990 GMAC mass shooting in Jacksonville was labeled the worst mass shooting to ever take place in Florida until the shootings at the Pulse nightclub in Orlando. A high-paying scavenger hunt is coming to Jacksonville. The National Park Service is inviting the public to participate in the planning process for the Visitor Use Management Plan for Cumberland Island National Seashore. Jacksonville achieved no-kill status back in 2014 when the Jacksonville Humane Society (JHS) chose to not to euthanize at least 90% of the animals that enter its shelter. Over the last couple of decades, the opioid epidemic has hit the U.S. hard in a series of waves. With less than a week to go before election day, candidates in Duval County are making their final push to sway voters. Being a homeless teenager wasn't going to stop First Coast High School student Seth Owen from achieving his dreams.